I won’t go into depth on every single example of these from the talk, but will focus in on just a few representative snippets for each of these aspects, citing specific direct quotes, with time stamps, from the YouTube video available here, and capturing one or two of the slides available here. 0:04 “I like to gauge the audience. There’s more of you than there are of me. I like to know where the punch might come from. Where are my developers? That’s devs; all right, there’s my friends. Who’s in a PMO or in a project management role? Oh… OK… OK.” (shows mock trepidation). It’s really notable: the speaker divides the audience right at the start, expressing an outright “them against us” stance. The speaker somehow feels the need to warn the audience against posting to the Twitter hashtag of #NoEstimates. He gives no specifics, just vague but dire warnings. All of that is especially odd, given the frequent declarations of #NoEstimates advocates of the importance of collaboration and trust. What? The fact that one can hold useful conversation about something somehow makes that thing itself not valuable? That’s quite a leap. 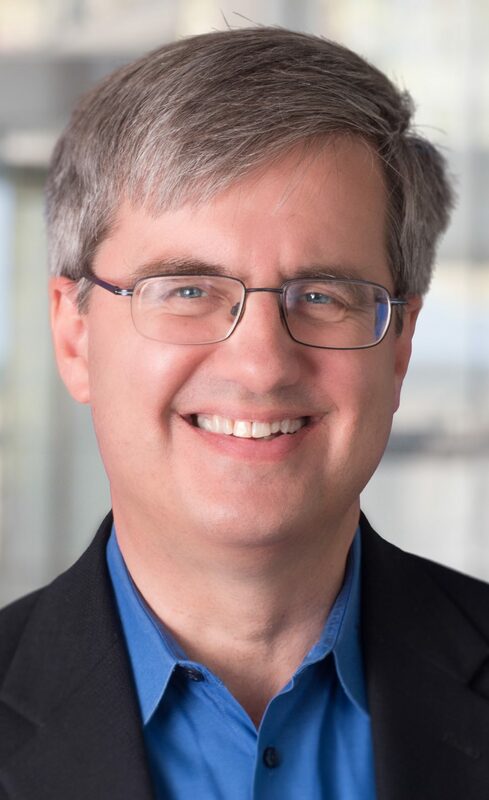 As one frequently tweeted quip states, “please stop using really poor examples of ____ to illustrate why ___ doesn’t work.” What extreme depictions of estimating such as “Excel gymnastics” actually illustrate, from this speaker, is an inability to understand or recognize how estimates can actually be used appropriately and productively. The analogy I always use: countless photos of twisted metal car wrecks do not make a convincing case for #NoCars. Similarly, if you dismiss all estimates as “magic numbers”, you probably need to read up on the many useful, well-known, non-“magic” ways to estimate. 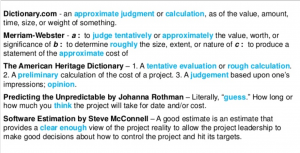 So, note how the speaker deliberately links major project disasters specifically and solely to the bugaboo of estimating (“taking a guess”): in short, without any specific knowledge or consideration of actual root cause, the speaker is reflexively blaming the use of estimates for those extreme project failures, across the board. Again, quite the leap. In what world are careful, methodical, facts-based estimates, made by software professionals regarding level of effort of proposed work items, equivalent to the Farmer’s Almanac? That’s a straw man, a mere derisive comparison. It’s surprising the speaker didn’t also trot out the example of Punxsutawney Phil. Watch the segment beginning at 9:07 carefully; it’s quite representative of the disturbing rhetorical flourishes throughout the talk. The speaker first polls the audience about what estimates are, pulling out selected comments that promote his targeted definition of estimates and scoffing at any that don’t. 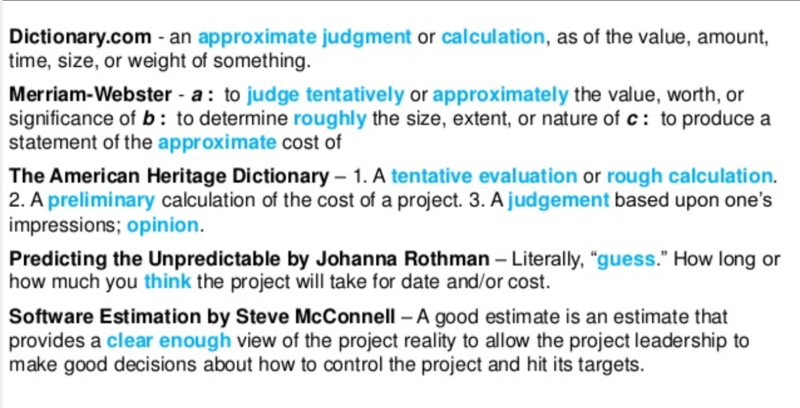 Then, he puts up a prepared slide (10:31) with five definitions of “estimate” taken from various sources. Again, all of these statements leverage and reinforce the speaker’s predetermined skewed definition and premise, i.e., that estimating is just guessing. Once you accept that extreme premise (see Layne’s Law), there’s no room for fruitful discussion of the many ways that estimates actually help in software development scenarios. So we see, amidst the intentionally skewed definition, there are multiple instances of repeated straw man logic, coupled with what is frankly just blatant audience manipulation. This is a rambling, agenda-laden mishmosh of extreme and unrealistic risk scenarios (lose it all plus 10x? Really?). Moreover, it’s intellectually dishonest. What he (mis)quotes is not even close to Steve McConnell’s point in his seminal book, Software Estimation. The speaker not only misreads the 25% / 75% description (which contains nary a mention of any “10x” factor), but he appears not to have finished reading the entire section, in which McConnell carefully spells out what he considers to be criteria for a good estimate. “With the background provided in the past few sections, we are now ready to answer the question of what qualifies as a good estimate. So, the speaker has cherry-picked a single isolated quote, misread it even, and then failed to notice that his cited source discusses that quote’s deficiencies and proposes something else as characterizing a good estimate. 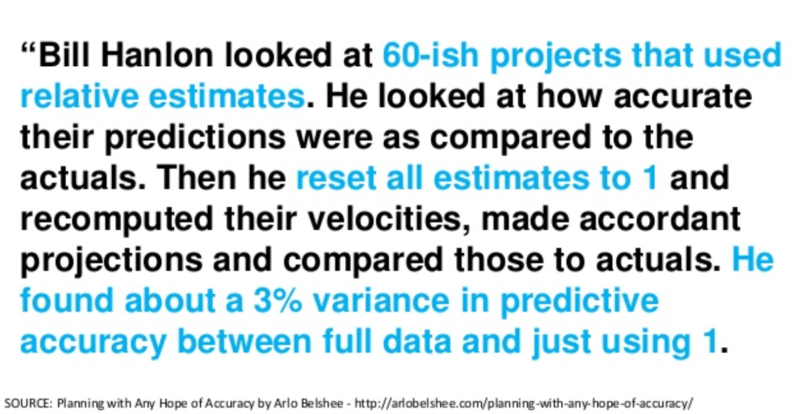 I’ve done this entire lengthy blog post without even discussing the weakness of the NoEstimates ideas themselves. As I said, those substantive points have been sufficiently covered for years now, essentially unanswered by the NoEstimates advocates (other than through blocking and insulting anyone who brings them up). The above deconstruction goes beyond those unanswered specific objections, by exposing the rhetorical and logic gaps of the movement as well: in short, a key takeaway here is that it’s not just that the NoEstimates ideas are faulty, but they’re very poorly argued as well. In fact, I believe that those two characteristics are linked. Poor arguments generally tend to lead to poor argumentation style, because nothing that is actually substantive (e.g., logic, facts, valid data) is available to promote the idea on its own merits. Rampant reliance on illogic, selective redefinitions, misquoting of experts, and phantom data actually exposes how unsupportable the ideas themselves are. Solid ideas wouldn’t need such trickery to convince people of their merit. Deconstructing this NoEstimates presentation, as I’ve done above, underscores how at this point, people need to look at NoEstimates advocacy chiefly as a glaring case study in poor behavior and faulty argumentation style. The title on this one pretty much speaks for itself. 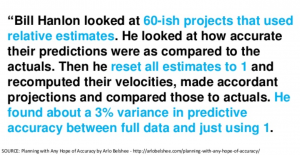 One pictures NoEstimates advocates earnestly explaining to business folks how planning always fails. It’s so full of misunderstanding e.g. 10:07 “estimates are determinism” shows how little he understanding the principles of estimating. But the bigger issue – and we see this at the conferences I speak at on Space and Defense Integrated Program Performance Management, is the decision makers are not in the room. For our IPPM, we’re missing the Program Managers and Systems Engineers and only the Cost and Schedule geeks are there. He points to the PMO, but no credible PMO cold do their job without estimates of cost, schedule, risk, and technical performance provided every week. 12:36 failure to understand the difference between Epistemic and Aleatory uncertainty. This failure can be found in other domains. Nuke Power and Manned Spaceflight know better but took them awhile. He has no foundation by which to discover how other domains have solved the issues – and there are many – with estimates. This is a simple failing of many in the NE world, they simply don’t know how to research a solution to a problem, and assume the first thing to comes into their head is the answer. Perhaps you are correct, in that the #NoEstimates movement has poorly presented some of its arguments. However, it’s more amusing and telling that your very first retort to a quote from the talk is disingenuous at best. “Blatant audience manipulation,” indeed. Impossible to get past this hypocritical bit. Let’s see: I didn’t somehow randomly choose to make my “very first retort” (as you put it) to be discussing the speaker’s “them vs us” attitude; I started with that because that’s literally where the speaker started, four seconds into the video. As I quoted, verbatim, he actually had an audience “show of hands”, expressly dividing them into who was likely to be on his side and who not. (Verbatim: “Where are my developers? That’s devs; all right, there’s my friends.”) Even though he invoked some lip service about “at the end we’re going to find a lot of congruence”, that doesn’t take away his opening salvo of blatant, undeniable “them vs. us” comments, including such references as “I like to know where the punch might come from,” etc. So, I’m not sure how it makes any sense at all for you to accuse me of “audience manipulation”, let alone hypocrisy, when I point out the speaker’s own words at the start of his talk, and quote verbatim his multiple, direct, intentional statements designed to divide up his audience explicitly into friends and foes. Agreed, Glen. As I basically said, the arguments themselves for #NoEstimates were countered effectively long ago. I could have spent the entire blog post talking about specific objections like that, but it just retreads old ground. I chose instead to zero in on the deception, illogic, manipulation, etc., which is kind of a meta layer above the actual issues. The: “We’re going to get along by the end. … I think at the end, we’re going to find a lot more congruence than we find disagreement” shouts of us-vs-them as well. It very clearly states that there exists a “we and you” here, just that hopefully we’ll get along anyway. Glasses are both half-empty and full at the same time. I can’t change your perception of it. Not being strongly convinced by either extreme (noestimates vs heavyweight estimation processes), I see it as some of both. Perhaps we should hearken back to the fact that the request for estimates, however necessary and well-intended, has largely fallen victim to truly damaging, abusive practice on the part of those asking for them, and as such has helped create this “us vs them attitude.” What could you (or we) do to help shrink that? – While they might view the heavyweight estimates folks as old-school and rigid, it’s probably not hard for them to understand why the business needs some information about what might be done. Not sure what your point here is, “Joe”; it seems to be fairly unrelated to the point of this blog post, which was to point out, in detail, the misleading tactics (skewed definitions, misquoting of experts, use of phantom data) that are used by NE advocates to promote their cause, as reflected in one very recent conference presentation by an advocate. You appear to have nothing to say about those tactics, besides objecting to my characterizing the conference speaker as openly promoting a “them vs us” attitude, which he undeniably does (see my previous response). My point was NOT that the NE folks are “trying to create discord”, but that they argue their case poorly by using these indefensible tactics. If they’re trying to find a “better approach to collaborating”, they should probably first work at NOT blocking their critics, NOT labeling us at every turn as “trolls, liars, morons, interlopers, box of rocks” etc, and instead actually engaging with some professionalism on the substantive issues. But they don’t. By all means, if you have substantive and specific defenses of NE positions (something more substantive and specific than just claiming that critics “view every statement as something to attack”), by all means jump into the discussion and make those points, preferably without clinging to anonymity, and preferably on a different post (there are many to choose from) where the pros and cons of NE positions are the direct topic, unlike this one, which is focused on exposing the poor NE tactics overall.